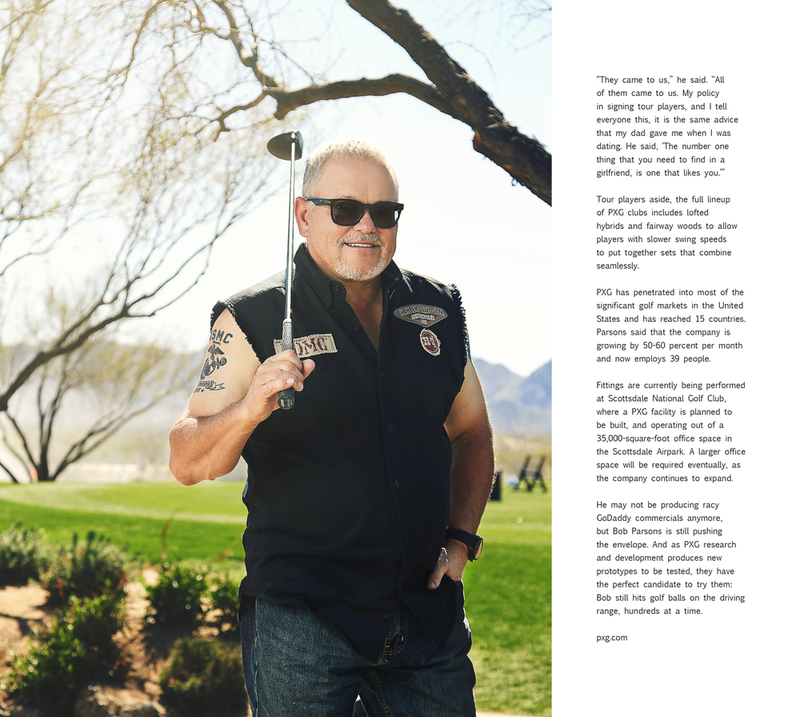 Bob Parsons, founder of GoDaddy is making big moves outside of the tech industry. Pretty soon you'll hear his name all throughout the golf world. After spending a quarter of a million dollars a year on golf clubs in hopes of improving his game, Parsons Extreme Golf or PXG was born. Clubs made without R&D time constraints or material budgets. No expense was spared with the design and manufacturing of his clubs, because he wanted them to be the best of the best. As you can expect, Mr. Parsons is an extremely busy man, so we were given 15 minutes to shoot with him at his golf course Scottsdale National. In that time we decided we would go with 2 set ups. White seamless for a mens health/fitness style and then out by the range. This gave us about 6 minutes in each set up since we had to take a golf cart ride between the two. Lucky for me, Mr. Parsons knows how to act in front of the camera and didn't need a lot of big adjusting, just some micro tweaks here and there. Overall the shoot was a success and we walked away with some great images. Below are some of the tear sheets from the shoot as well as a look at my first set up with my awesome assistant standing in for a light test. Phoenix commercial photographer, Brandon Tigrett produces fitness lifestyle and portrait photography for advertising and corporate clients nationwide. His main area's of expertise are in active lifestyle, fitness portrait and headshot photography.